You may have seen people paddle boarding on a nearby lake or river. Perhaps you’ve even rented a paddle board while on vacation and, like so many before you, you’ve fallen in love with the fastest growing watersport in the world. So you consider buying your own SUP board. 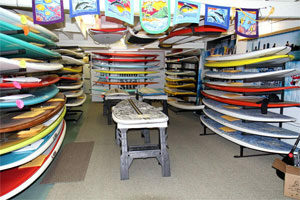 But how do you choose the right paddle board from the hundreds of boards that are available. And what is the best paddle board for beginners? In this article we’ll tell you all you need to know to choose the best paddle board for you. Also read: 25 Best iSUP Boards Reviewed. To find the right paddle board, you should first consider the type of paddle boarding you’ll be doing. SUP surfing: If you want to ride the waves, a SUP surfing board is your best choice. Generally meant for intermediate and advanced paddlers, SUP surfing boards are typically shorter (max. 10′), narrower and have a narrower nose and tail than all around models. All around SUP: All around boards are usually thicker, wider and longer than SUP surf boards. They usually range in between 10′ to 12′ in length and 29” to 36” in width. All around boards are the most versatile types of SUP boards. As the name implies, they are great in all kinds of conditions. Unless you have good reason to go for another type of SUP board, an all around board is probably the best paddle board for beginners. Touring or racing SUPs: Touring boards are longer than all-around boards (usually they come in 12’6” or 14′ in length) and have a pointy nose and typically have little to no rocker. These boards are great if you know you’ll spend your time cruising your lake, river or even for open ocean touring. A version of a touring SUP is a race board. Compared to tourings boards, race SUPs are much narrower giving them less drag and more speed. The downside is that this makes race SUPs much more difficult to stand on. Yoga and fitness SUP: Doing your yoga routine and pilates on a stand-up paddleboard is a fresh trend called Yoga-on-Water (YOW). It’s perfect for people who are looking to get fit but who are bored with the usual gym setup. As you try to balance on your board, you are actually training your muscles and core strength. A yoga SUP board is generally wide for more stability and balance. SUP for kids: Stand up paddle boarding is a great activity for you and your children. Not only is SUP boarding extremely fun to do by themselves or with friends but it also gets your children in the fresh air, helps to build their water confidence and has many great healthy benefits by getting kids active. The right SUP board for your child will depend on his or her length and weight, but most SUP boards for kids are shorter than 8′. Take a look at these paddle board examples. Length x Width 8’6″ x 29.6″ 10'5" x 32" 12'6" x 30" 9'9" x 32" 8' x 30"
Do you see the differences between these boards? 1. The Surf SUP is shorter and has a pointy nose and tail. The sharpened sides of the board, called the ‘rails’ and the deep double concave from the middle of the board all the way to the back make this a great paddle board for sup surfing. 2. The All-Around SUP has the more traditional, rounded shape. All around paddle boards are designed to perform well in many conditions, from flat water to actually surfing these boards can to a certain extend do it all. 3. The Touring SUP is longer and a bit narrower. The pointy nose with the displacement hull shape help the board maintain course better, making for more pleasant touring. 4. Yoga or Fitness SUP boards are wider for more stability and the best yoga boards have a larger traction pad area. Many prefer an inflatable yoga paddle board as the surface is a little softer. 5. SUP boards for kids usually are about 8′ in length. The shorter board makes it a little easier for children to carry and maneuver. Whether these particular boards are the best sup board for beginners depends on several other factors, like: the volume of the paddle board and its maximum weight capacity, and the length, width, and thickness of the SUP board. A SUP board must be able to carry your weight. If the board does not have enough buoyancy to support you, you’ll at least have a less optimal paddle board experience, or the board may even sink under you. The volume of the board and its maximum weight capacity are therefore important factors for you to consider. Volume: The volume of a paddle board, measured in liters, is an indication of how much weight the SUP board can float. The more volume, the more weight the board can support. A shorter board can have a higher volume if it is wide and thick. Likewise, a longer board can have a lower volume if it is narrow and thin. How much volume you need, also depends on the type of paddle boarding you intend to do and upon your skill level. 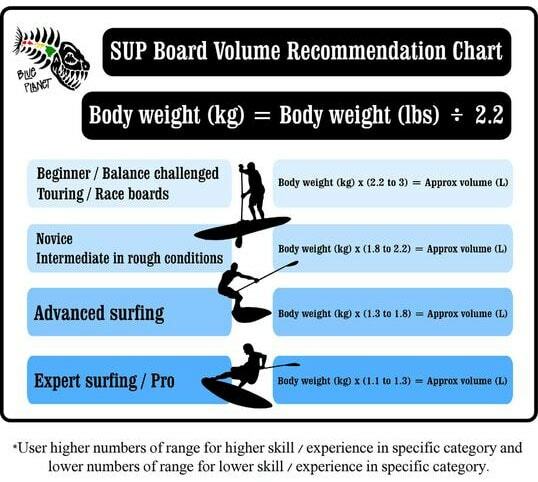 Blue Planet Surf provides this helpful chart to calculate how much volume you’d need. If you’re a beginner paddle boarder who weighs 180 lbs. 180 lbs equals about 82 KG (180 : 2.2). Based on your skill level Blue Planet recommends that you multiply you body weight (kg) x 2.2 to 3. So look for a paddle board with a volume between approx. 180 – 246 liters. Max. Weight capacity: Not all paddle board manufacturers provide the volume of their boards. In these cases look for the maximum weight capacity. Again, if the board can’t support your weight, it will ride lower in the water and be more difficult to paddle. When considering the required weight capacity, do keep a wide safety margin. In our paddle board reviews we sometimes encounter that manufacturers are a bit too optimistic with the maximum weight capacity they mention in the specs. So don’t tax a board to its weight capacity limit, but choose a board that has ‘surplus’ capacity, since this will generally give you a better paddle boarding experience. To give a paddle board more volume, SUP manufacturers can make them longer, wider and/or thicker. Length: when choosing the length of a SUP board, consider how you will use it. For SUP surfing you need more maneuverability, and therefore a shorter board. For touring on the flat water of a calm laker, you’d prefer a board that tracks well, so you’d pick a longer board. Width: the width of a paddle board to a large extend determines the stability of the board: The wider the board the more stable the board will be. However, the narrower the board, the less drag the board will have through the water. So narrower boards are generaly faster than wider boards, at the expense of stability. Thickness: especially with inflatable paddle boards the thickness of the board determines how rigid the board is. Thinner inflatable SUP boards (4”) are often not rigid enough for a heavier paddler, giving less stability while paddling. 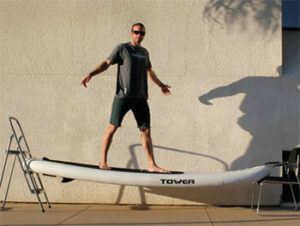 An often used test to determine whether an inflatable paddle board is rigid enough, is to place board with the nose and tail section on two chairs and to stand in the middle on the board. The best inflatable paddle boards are usually 6” thick, and are remarkably rigid during this test. They hardly bend at all. While thinner inflatable SUPs often fail the test, by simply folding double. Fins provide tracking and stability to a SUP board. For flatwater paddleboarding you need at least on large fin. If you also intent to take your paddle board out in the waves, you’d need a 3-fin setup. The two extra side fins add traction and deliver better control in the surf. Inflatable paddle boards come with either one or three fins. The large center fin can often be removed for storage. Before you start shopping for your new hobby, you should consider the amount you will spend. The SUP board is obviously going to be your main expense. Paddle boards range in price from around $400 for the cheapest SUP boards all the way up to over $1,800 for the most expensive paddle boards. Do keep in mind however, that you will require several SUP accessories as well. After purchasing a board, there are a few other pieces of equipment you’ll need to enjoy paddle boarding. Paddle: A SUP paddle look like canoe paddle that is longer, lighter and has a slight bend near the blade. Stand Up paddles come in a variety of constructions, from plastic, aluminum, wood, and carbon fiber – all with a variety of handle, blade and shaft shapes. The general rule is that a SUP paddle should be 6 to 10 inches taller than the paddler. Go for a longer paddle for flat water use and a shorter paddle for use in the surf. If the paddle will be used by more than one person, choose an adjustable paddle, so that each paddler can adjust it for the optimal length. Leash: If you fall off your paddle board in the surf, or in windy conditions, your board can drift away in seconds, bringing you in a potentially life threatening situation. A SUP leash attaches to your ankle (or kalf) and keeps your paddle board tethered to you. The general rule of thumb on SUP leashes is to get one about a foot longer than your board. SUP leashes are a little thicker in diameter than surfing leashes and start at about 5/16ths inch. PFD (Personal Floatation Device): The U.S. Coast Guard classifies stand up paddle boards as vessels when you use them beyond the limits of a swimming, surfing or bathing area, requiring you to wear a PFD. If you go paddle boarding after sunset the regulations also require you to carry a safety whistle and have a light available. Clothing: Choosing a wetsuit, a drysuit or regular swimwear lies entirely on preference. Usually, paddlers prefer the wetsuit for cold water paddling and for its snug fit. A waterproof drysuit is also preferred by paddlers who also do diving or kayaking, although it is not designed to give warmth. In warmer conditions, you can also stick with your swimsuit and swim trunks, or shorts and a T-shirt – something that doesn’t hinder your movement and can get wet. Board bag: Many dings and blemishes happen outside of the water – usually in transportation or storage. Board bags are often padded and offer more protection to your paddle board. They also make traveling with your board easier, and add to you board’s life span. Car rack: Unless you have an inflatable paddle board, you need a way to transport your board on your vehicle. Paddle boards can be strapped on any vehicle with car racks. Many surfboard soft racks will fit a paddle board. If your vehicle already has an existing rack system, you can simply use straps and padding to tie down the boards to the existing hard rack. So, what’s the Best Paddle Board for Beginners? The answer is, it depends! It mainly depends on what kind of stand up paddle boarding you will do, and what size (esp. weight) you are. But with the above information you should be able to make an informed choice when buying your first paddle board.